Early stage funding for UK startups dropped by 15% in 2018, according to data published in Yahoo Finance by Beauhurst, a consultancy that track equity funding. Overall equity funding in the UK reduced to £7Bn in 2018, down from £8.6Bn in 2017 and there was a 10% decline in the number of deals completed. This is a concerning drop that may create a need for alternative forms of startup finance. There are pros and cons to equity finance, as explained in our list of the methods of funding a company. The biggest drawback is that you often have to give up some ownership, and control of your company. 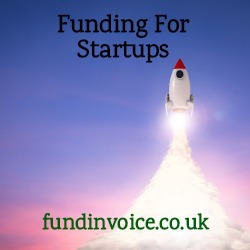 With debt based funding that is not the case, you borrow money to fund your venture and once repaid the lender usually has no further involvement. That said, you may be able to access equity funding earlier in the business cycle. If you are considering using your own money, there are a number of reasons not to use your own funds to finance your startup. If you have not been able to raise funds through equity finance, there may be alternatives available. If you have a few months trading under your belt, or additional security (such as property) to offer, a business loan may be possible. In simple terms an agreed amount is advanced up front, with repayments (including a margin for the lender) repaid via monthly repayments, over a fixed terms. If you have started trading, and have outstanding invoices on credit terms, an invoice finance facility may be possible. This releases an agreed percentage of each invoice (often 85%) up front, without having to wait for it to be paid. When you have a sales ledger of such invoices, a substantial amount of cash may be funded through these prepayments against invoices. If you operate in retail or construction they have specialist forms of funding. Retailers that receive credit card sales income can borrow an agreed amount against that credit card income stream. The finance is repaid at an agreed percentage of future receipts. In the construction sector, funding against applications for payment can operate in a similar way to invoice finance, releasing cash as prepayments.